First boat ? – Dirty wet dog , boats and sailing. This year i have made it my intention to post regularly at least 2 or 3 times a week every week rather than having writing binges and then longer periods not posting. At the moment readers will realise that i am in the middle of essential projects at home that have to get done. This morning for instance the computer has been on and off while the sparkie starts to work on the lights and power for our spiffy new bathroom. I had my first shower in there last night after an achingly long day at work and it was bliss to have an actual hot shower not just inside the house rather than a boat wash out on the deck (cold) but with high volume and hot water rather than a miserable dribble. Its exactly the time of year when i should be getting my boat ready to sail except that its already in the water and there shouldn’t be much to do as it stays in near permanent commission. I did hardly any sailing in the autumn compared to what i wanted to do but that is because i seemed to be continually working on jobs here. I know that if i go down to the yard here or where the boat is the keen owners will be starting on their spring preps now, there might even be a few getting ready for spring series racing. Today though i am going to start a new thread of posts all based on a comment from a new blog follower : someone who has read a couple of my posts and is thinking about buying his first boat. I remember my first boat almost painfully and its a subject i have talked about many times with other boat owners : what they bought and why, what they thought about their first boats etc. My first boat was a pretty awful east German folkboat , the version with the ugly and high doghouse and a very dodgy petrol engine, most of her ribs were cracked or broken and overall she needed a total rebuild/refit and far more knowledge and skill than i had back then. Nowadays i would know what i was doing if i chose to go down that route although there is a much greater chance that i would ask why i was bothering with that much time and expense when there are better, cheaper and easier ways to get a boat on the water quickly. This picture isn’t of my boat and not my picture either but it was the same type. This morning i was thinking back to a conversation like this that i had with one of my fellow crew members during the Whitbread race (loong time ago) when we were talking about our first boats. So i had a leaky, cracked , wet and ugly east German folkboat and at almost exactly the same budget he and his brother had an Achilles 24 and today there are dozens of both boats still on the water. Not exactly a first boat post but i did a quick cover of a very modified Achilles 24 in “How small- Ocean” which was based on Roger Taylors arctic adventures aboard his engineless and junk rigged version. Just remember that his voyages are in high latitudes and he is out there for around 7 weeks a trip so that gives some indication of the carrying capacity of a lightweight 24 footer. Its also worth saying that Roger’s previous arctic-going boat was an even smaller Corribee at 21 feet and quite slim too. Today i wouldn’t chose either a Folkboat as a first boat, a triple keel version of the Achilles might just work for the kind of sailing i do now as would a Corribee but this isn’t about my first boat any more , rather its about first boats in general . My own sailing history is a bit unusual for somebody of my age in that i didn’t start sailing as a youth in dinghy’s, i would probably have been a much better sailor if i had !, rather my first sailing was in a half-decked one-design with a cuddy but after that i went straight into the local ‘offshore’ racing scene. The boats that i then sailed for many years were the typical club boats of that era : mainly IOR cruiser-racers from quarter ton and up to one-tonners. I hardly ever went cruising, our cruising sailing was the sailing that was done to either get to or back from a race. That’s not a bad way of getting a lot of sailing experience for a beginner either. After that my sailing took a quantum leap when i joined a crew as medic for the Whitbread race and for 5 years then worked in the industry. It was really only after that when i started to sail just for pleasure and to think about owning another small boat myself. What i did during the long years when i couldn’t afford a boat, especially living in the solent, was to amass information and knowledge about small cruising boats. One approach which i will describe in greater detail in this series of posts is that i worked out an ideal or ‘best’ boat at several budget points, at that time starting with a £500 budget and working up to around £5.000….it can be done, a friend of mine in the industry got a boat on the water and to the Caribbean for £1000 ! I will try to make this a series of posts, and as always it would be great to hear from my readers about their first boats. Somewhere in the back row of a scruffy boatyard there is a first time boat waiting for a bit of attention. Most of the boats i look at nowadays are small cruising boats and many of those would make good starter boats. So i will finish with a couple of photographs of the type of boat that i almost bought as my next cruising boat and one which i think would make a neat ‘first’ boat for a single sailor or a couple. 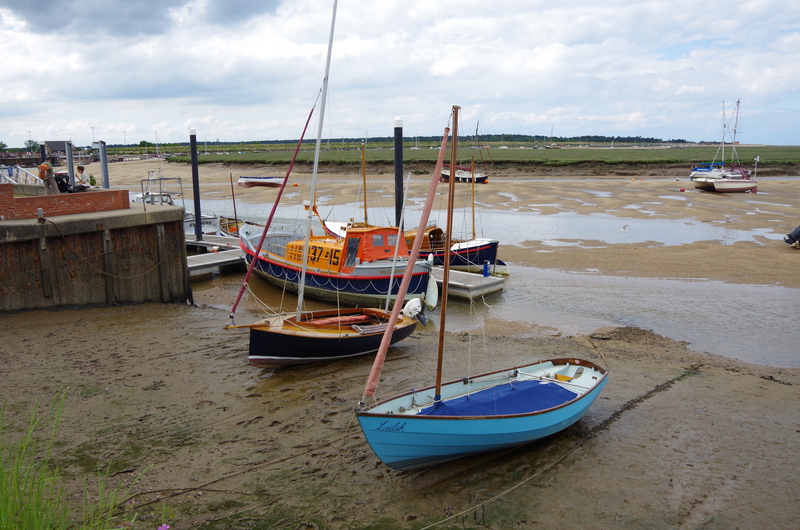 The 2 boats in the picture are both Sadler 25’s, one has bilge keels (but quite good ones) and the other one a deep fin keel. In a future post in this series i will explain why i think the Sadler would have been a good boat for me and my partner and why it would be a good starter boat.